If Steven Seagal’s quick movements (or his seeming lack of movement) have fascinated you or if you’ve been left open-mouthed with his martial art technique that seems to be so smooth, so swift and yet so very effective even without the usual kicks and punches, then the International Seminar held by the Aikido Foundation of India at the Sanskriti School gymnasium was where you ought to be. Seagal is an Aikido black belt. The seminar, (4th – 5th February), will see 15 Aikido black belts and 20 students (more are expected to join on-the-spot) practicing this art for ten hours. Demonstration will open for the public in the afternoon of the first day. The event is co-sponsored by the Sun Group. The delegation from USA is headed by the Shihan Gaku Homma Sensei, a direct student of the founder of Aikido, Morihei Ueshiba. He is accompanied by seven high-ranking Aikido practitioners. Homma Sensei is the founder and chief instructor of the Nippon Kan School, which is the biggest school in the Rocky Mountain area in the US. His unique teaching methods combine sword and staff techniques with the open-hand techniques. 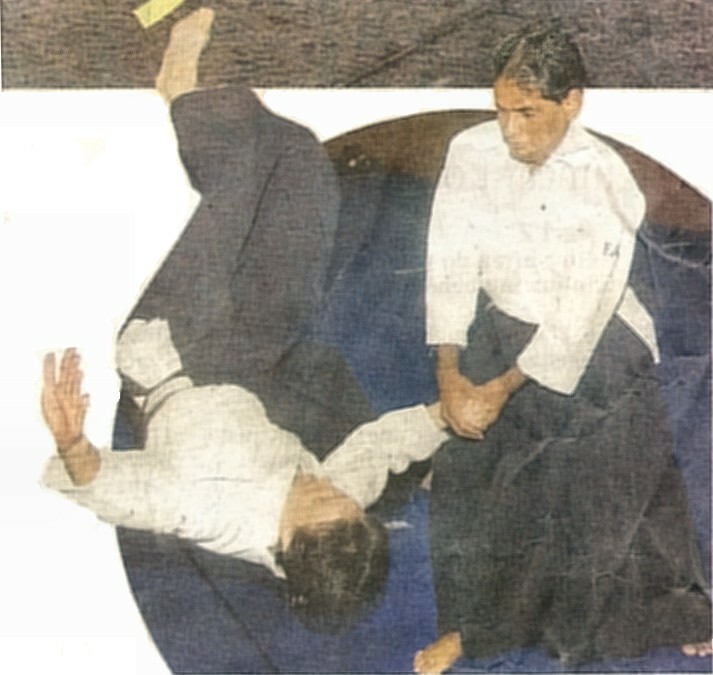 The Aikido Foundation of India was founded in Delhi by Sensei Paritos Kar in 2004. Paritos Sensei is fourth Dan (degree black belt), who did his entire 15 years of training in Japan. The Aikido dojo (training centre) in Andrews Gunj has 19 students, only 6 of whom are children. Those interested can contact the dojo at 9811155388. Aikido was founded by Morihei Ueshiba, also known as O Sensei. Aikido was founded when O Sensei, dissatisfied despite his mastery in jujitsu, began looking for a deeper meaning to life. He finally incorporated his martial arts training to his religious and political ideologies to create aikido or “The Way of Harmony of the Spirit”. Aikido is a defensive non-aggressive art. It seeks to unify mind and body so that the student trains at remaining calm and centered in the face of an attack. Practitioners, rather than tiring themselves out with kicks and punches, use the opponent’s own strength to gain control over them and throw them off, with emphasis on motion and the dynamics of movement. Thus Aikido is unique in that it can be learned and practiced by anyone from six to 80 years. Because aikido combines martial arts, religious and political ideology, there is no unified philosophy of aikido. There is, instead, a collection of religious, ethical, and metaphysical beliefs. Some examples: “Aikido is not a way to fight with or defeat enemies; it is a way to reconcile the world and make all human beings one family.” “The essence of aikido is the cultivation of ki [a vital force, internal power, mental/spiritual energy].” “The secret of aikido is to become one with the universe.” “Aikido is primarily a way to achieve physical and psychological self-mastery.” “The body is the concrete unification of the physical and spiritual created by the universe.” And so forth.